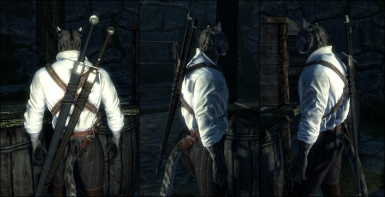 This mod works with both genders and beast races. I use the Vanilla skeleton, and I use Skysights Skins for male and CBBE slim nevernude for female, I also use Deadly Mutilation and there's no conflicts or ctd. 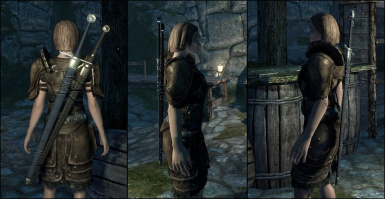 I know someone will want to ask how I got Both the swords onto my characters back, I just use a Skyrim.ini edit, under [General] "bDisableGearedup=0", without the quotation marks, it has some bugs for sure, and I know there are other Equipping mods that do the same thing. 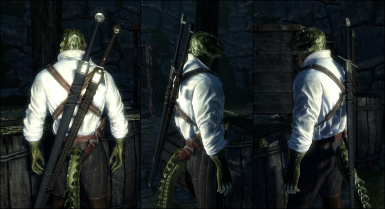 I would recommend you use DragonDude1029's Equipping Overhaul: http://www.nexusmods.com/skyrim/mods/49784/? 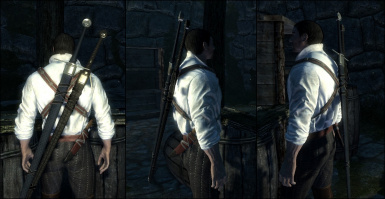 I made this mod to work well with JRC0011's amazing sword mod, JRC's witcher style sword pack: http://www.nexusmods.com/skyrim/mods/71912/?